"Clara" a new opera about Clara Schumann with music by Victoria Bond. 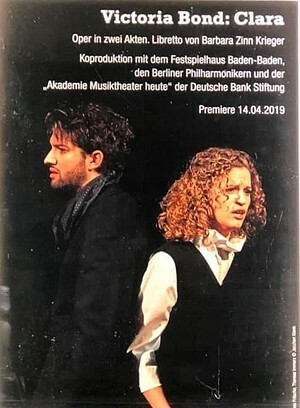 "Victoria Bond has struck gold in the story of Victoria Woodhull, the first woman to run for the American presidency"
Victoria Bond's opera, "Clara" about Clara Schumann, with libretto by Barbara Krieger, was directed by Carmen Kruse in a production April 2019. Victoria Bond gives pre-performance lectures at The Metropolitan Opera in New York City and at Guild Hall in East Hampton, NY. Victoria Bond, founder and artistic director. April and May at Symphony Space in NYC. Festival dates and details.